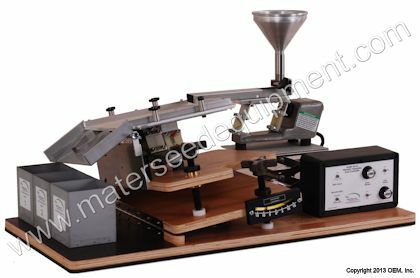 Convenient interchangeable decks offer different textures to accommodate a wide range of seed separations. Fine tune and document your process using Digital Counters that display the settings for each Bulk Vibratory unit. Easy to read inclinometers show the deck angles to facilitate accurate setups. Reliable Syntron™ Vibratory Feeders transport the Bulk Seeds and vibrate the Seed Deck. Fully Adjustable Bulk Seed Hopper holds 500 cc. Polyurethane Coated Furniture Grade Plywood construction and Rubber Vibration Damping Pad for quite operation. Deposits the Separated Fractions into one of three 1,000 cc Collection Containers. Magnet Sheet holds the Collection Containers in place during operation. Requires seed deck from list below for operation.